When it comes to swim lessons, Naperville parents are constantly hearing the stress of signing their kids up early on to get them swimming from a young age. They hear it is important to get their kids into the many swim lessons Naperville offers for development, safety, education, and fun. But what about the older kids? It seems like people forget to talk up the importance of swim lessons for children of any age, especially tweens. Swim lessons are an essential skill for any individual- child, teen, or adult. We all know that drowning is America’s second leading cause of accidental death of kids under the age of 14. Enrolling children of any age in swim lessons leads to an 88% reduced risk of drowning. Yet, the Centers for Disease Control reports that an estimated 37% of American adults still cannot swim. Fortunately, swimming is a skill that can be taught at any age- it is never too late! Older children and tweens can learn to swim quickly and easily when enrolled into the top quality swim lessons Naperville offers for this age group. Conversely, if your children already learned to swim when they were little, this doesn’t mean they can stop learning. Swimming needs continuous learning and practice. It is common that children who are confident in the water as young kids are not pushed to continue pursuing lessons into their tween and teen years simply because they already know how to swim. However, for reasons of safety and skill, lessons should continue. Here are our top reasons why you need to get and keep your child involved in the quality swim lessons Naperville pools have. The Centers for Disease Control reports an average of 3,533 deaths from unintentional drownings (non-boating related) every year in the US. One in five of these deaths is a child under the age of 14. In the summer of 2012, 137 children died from drowning. Clearly, drowning is a real problem. While the most fatalities happen to younger children, older children are the ones who are more likely to be around water when parents are not present. Whether the neighbor’s pool, a day trip to the beach with friends, or other encounter with water, the reality is that the opportunities for children to be around water are numerous. Swimming is an essential skill, even if your child doesn’t plan to be doing laps at the local swim club. Relieve stress for both you and your child by making sure they enroll in Naperville swim classes and get the critical skills down. Unique to swimming as a sport is the fact that it is both a team and individual sport, meaning that your child can gain the technique and receive the benefits of both these forms of sport. 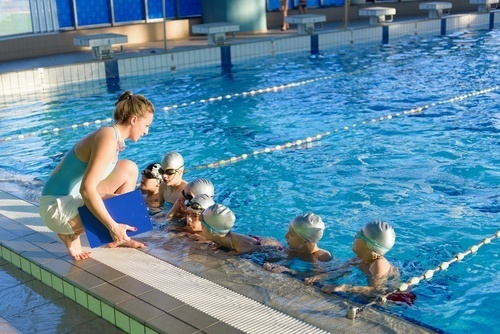 Kids get instruction and motivation from teachers when in their swim lessons, plus they get to learn and interact with other children in class with them. Then there is of course the advantage of joining the swim team, where they build teamwork skills and get to compete against other teams. If not for any other benefits, Naperville swim lessons offer a great workout! Swimming is a total body workout that works your core, legs, and arms. Enrolling your child in swim classes gives your kids the opportunity to exercise while having fun. You’ll be happy to have your son or daughter in one of our swim lessons in Naperville, because they can gain fundamental skills while staying active. Major physical benefits to swimming include: cardiovascular exercise, increased strength, more flexibility, and all-over muscles. Did you know that swimming classes can help your child do better in school? Swimming has been scientifically linked to better academic performance. Studies have found that kids who swim throughout their developmental years were quicker to achieve both physical and mental milestones. Scientifically speaking, the sensory learning and particular type of instruction that kids receive during swim classes translates seamlessly into the type of learning that goes on in the classroom. Possibly the best part of the swimming lessons Naperville offers is that it is something kids can do at any age, even into adulthood! Whether young or old, swimming is a sport that everyone can take part in and enjoy. It is truly an activity that can last a lifetime. Expose your child as early as possible and help them gain a skill that will always come in handy, and that they can enjoy for the rest of their lives! No matter what your child’s age, sign them up for the best swim lessons Naperville provides to get them in better physical, mental, and emotional shape! Contact DuPage Swim Center today and sign your child up for an investment that will pay off for the rest of their lives.